In 1909, Cocteau met Sergei Diaghilev, the Russian impresario who launched the Ballets Russes, a company whose principal dancers then were Anna Pavlova and Vaslav Nijinsky. Diaghilev encouraged Cocteau to write for the ballet and it was he who famously challenged Cocteau, "Ettonne-moi!" (Astonish me!). Cocteau responded with the libretto for the ballet Le Dieu Bleu. Cocteau also first encountered Igor Stravinsky around this time. The composer was in the process of writing The Rite of Spring when the two met and, while visiting Stravinsky in Switzerland in 1914, Cocteau completed his first novel, Le Potomak. In 1917 Cocteau met Pablo Picasso. Together they traveled to Rome and met with Diaghilev. 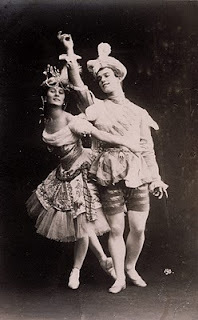 The two were soon involved in Diaghilev's production of the ballet Parade. Picasso designed its sets, Erik Satie wrote the music, Lèonide Massine (Ljubov in The Red Shoes) choreographed and Cocteau wrote the one-act scenario. Although the Paris opening was a disaster, the ballet went on to become successful. In another post-World War I venture, Cocteau founded a publishing house, Editions de la Sirene. The company published Cocteau's own work as well as scores by Stravinsky, Satie and a group of composers known as Les Six. Jean Cocteau's first film was the surrealistic Le Sang d'un poète (The Blood of a Poet). Released in 1930, it was an early experimental reflection of his personal mythology. Cocteau also wrote what some consider his greatest play, La Machine Infernal, in the early ‘30s. In 1946, Cocteau directed his sublime and bewitching film adaptation of the fairytale, La Belle et la Bête (Beauty and the Beast) starring Jean Marais and Josette Day. 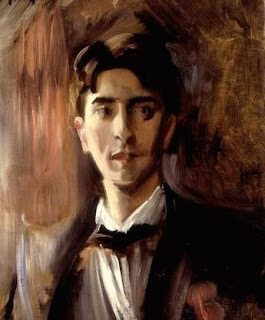 Director Renè Clèment provided technical assistance, illustrator/designer Christian Bèrard served as costume and production designer (with the exteriors evoking the illustrations of Gustave Dorè and the interior of Belle's family home echoing Vermeer) and composer Georges Auric (Roman Holiday, John Huston's Moulin Rouge) created the Impressionistic score. Marlene Dietrich reportedly was with Cocteau when the film was first screened at a studio in Paris and, at the end, after the beast had transformed into a prince, she called out to the screen, "Where is my beautiful beast?" (I felt the same the first time I saw La Belle et la Bête). 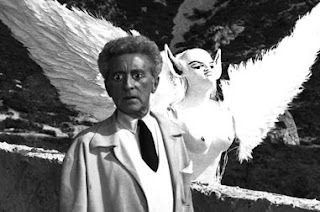 1960 brought Cocteau's last film and the final installment in his 'Orphic Trilogy' (along with The Blood of a Poet and Orpheus): Le Testament d'Orphèe (The Testament of Orpheus). An intricate 'home movie,' the film starred Cocteau as an 18th-century poet seeking divine wisdom and included cameos by everyone from Pablo Picasso and Yul Brynner to Jean Marais, María Casares, Jean-Pierre Leaud and Françoise Sagan. Cocteau led a high profile life all his adult years. Friend and collaborator of Picasso, Stravinsky, Satie and Diaghilev, he was also an intimate of French icons Collette and Édith Piaf. 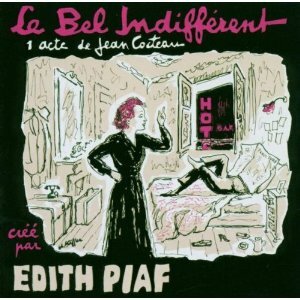 In 1940, Cocteau had written a hit play for Piaf, Le Bel Indiffèrent, and in the early '50s he wrote an article that was instrumental in reviving her career. It was Cocteau who, in 1948, introduced American wunderkind Truman Capote to Collette. Cocteau had told Collette about Capote, "Don't be fooled...he looks like a ten-year-old angel. But he's ageless, and has a very wicked mind." Collette and Capote bonded and he cherished the gift she gave him that day for the rest of his life. Jean Cocteau died at age 74 at his chateau in Milly-la-Foret, France, on October 11, 1963 after learning of the death of Édith Piaf. Legend has it that Cocteau heard the news, remarked, "Ah, la Piaf est morte. Je peux mourir aussi..." (Ah, Piaf is dead. I can die, too) and suffered a fatal heart attack. David Thomson has aptly described Cocteau as "a comet passing over French cinema, throwing a vivid light on the landscape..."
Lady Eve - this post is - well - astonishing! I adore it and thank you for it. A comet, indeed - and a great artist among so many. Wouldn't you have loved to have been a guest at one of those dinner parties? I think that's what might have inspired Woody Allen's "Midnight in Paris"! Loved this post, Ms Eve. Cocteau was a poet, heart and soul, no matter what medium he worked in (I never heard about him as a boxing manager - of course, that sport has certain elements that artists have always been attracted to). I never forget walking into a small, art-house theater decades ago and seeing my first cinematic Cocteau - a double feature of "Beauty And The Beast", followed by "Orpheus". That's one of the most memorable, beautiful film experiences I've ever had because I was entering the unique and complete universe of Jean Cocteau. His artist's visual eye and poetic sensibility translated perfectly to film. Do we have anyone in film today doing anything remotely along the lines of Cocteau's visionary work? It's difficult these days, for a number of reasons, but I would say that Tarsem Singh's "The Fall" is a good candidate. A beautiful post Lady Eve and a great summary and tribute to Cocteau. Orphee is one of my top 10favorite films. Its images and language are haunting to me. And I love Cocteau's simple but masterful line drawings, examples of which which he used in the opening titles to the film. There are certain periods that abound in cultural talent and creation. This one that you discuss has to be one of the great ones of history. I am very happy to hear from those who appreciate not only the inimitable Cocteau, master of so many fine arts, but who are also connoisseurs of that era, early in the last century, from which so many groundbreaking artists arose - Picasso, Stravinsky, Satie, Nijinski and other European giants - as well as the celebrated American contingency - Fitzgerald, Hemingway, etc. WOW!!! well done my dear!! no criticism for my corner...was not aware of your knowledge of french cinema...cocteau was unique in the arts...ORPHEUS & BEAUTY AND THE BEAST are must see films!! Eve, I have learned so much from you about French classic cineman, something I had never really been familiar with. This article just fascinated me, and I have written down the movies to try to find them. What a life, what a charmed life for Cocteau. To have known Diaghilev, Nijinsky, Stravinsky, Piaf, Picasso (I have 2 Picassos hanging in my living room)....I don't know what Cocteau's personal life was like, but how blessed to be an intimate part of the lives of such great artists. Just an excellent article, Eve. 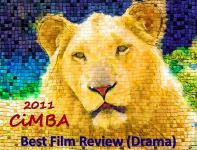 Eve, I did see from your clip that there must be a full copy on Youtube of La belle et la bete. I can at least watch it that way, which is fine with me if I get to see it! Anyone who has never seen "Beauty And The Beast" (or any other Cocteau film) I really reccomend acquiring the best quality dvd possible (they're easily found). As Eve mentioned in her post, Cocteau was inspired by both Gustave Dore and Vermeer in his lighting and overall visual presentation in "Beauty And The Beast" - it's gorgeous to look at and there is much exquisite detail and shading that really need the highest resolution possible to fully appreciate. Same goes for the sound quality when there's a score as notable and evocative as the one Auric created for this true classic film. "Beauty And The Beast" is the stuff dreams are made of - a very special creation. Hi again, Eve -- Netflix does have B&B a well as Orphee, but they are on disc, and I'm the instant streaming financial category! LOL! I'll check the library too. And of course, small or not, I could still see it on YT. Eve, between seeing the marvelous MIDNIGHT IN PARIS recently and reading your bewitching post about Jean Cocteau this evening, you have me wanting to revisit BEAUTY AND THE BEAST and other Cocteau films; it's been so long since I've seen them. Thanks for encouraging me to reacquaint myself with them! Hi Dorian - This weekend I'll be watching the Criterion Collection's boxed set of "Cocteau's Orphic Trilogy." I haven't seen "The Blood of a Poet" or "The Testament of Orpheus" for years. Hoping to see "Midnight in Paris" soon - I've heard so much about it. Really loved "Match Point," one of the best of Woody Allen's films.